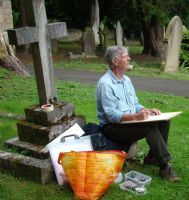 Some members are enthusiastic en plain air artists such as "Nick in Northumberland" illustrated below, we also organise occasional group en plein air events such as the picnic days illustrated below. The most recent was June 2018 at St George's Church Jesmond. The church gave us challenging sketch subjects from the spectacular Art Nouveau interiors to the 'Venetian' tower. It was a cold day, but Ian's hot fried (en plain air) samosas warmed us up. 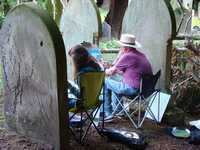 2016 at St John Lee, the weather was not great weather either but Ian cooked up hot sausage sandwiches and Wendy and John made cakes, members made some great paintings and sketches, inspired by the leafy churchyard and the open landscapes with poppies injecting surprise colour beyond. 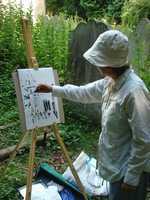 6th August 2015 A day out painting was organised in Lord Allendale's estate at Bywell. Some members were put off by the terrible weather forecast. But the sun came out by lunchtime and the threatening morning clouds passed us by. 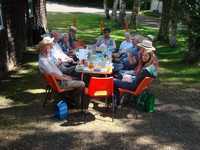 The 'picnic and paint' day on 25th June 2014 was at Corbridge where members sketched on the banks of the Tyne and surrounding town of Corbridge. July 2013 was at the Church of St John Lees near Corbridge.